Residual flow after device occlusion of patent ductus arteriosus (PDA) is not uncommon, and is usually due to inadequate thrombus formation in the device. 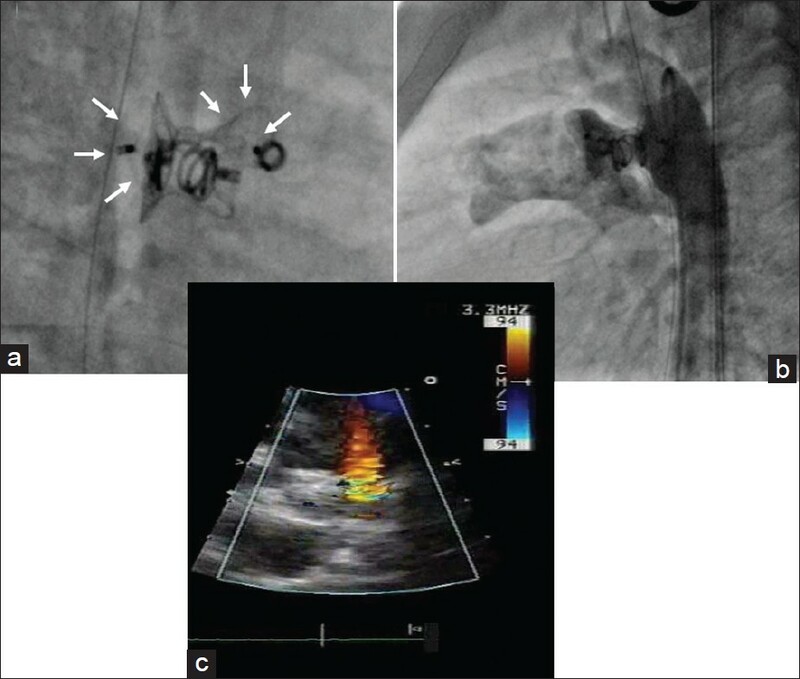 We present a case with large residual flow persisting 6 months after Nitinol device closure of a Type A ductus, which was successfully managed by intra-device coil placement and additional deployment of a second Nitinol device. A 3-year-old symptomatic girl was diagnosed to have a large PDA, left to right (L-R) shunt, left atrial and left ventricular volume overload (LALVVO), and moderate mitral regurgitation (MR). Moderate MR was considered secondary to annular dilation from the marked LALVVO. On angiogram the PDA measured 6 mm at the pulmonary arterial end and 13 mm at the aortic ampulla. She underwent device closure of PDA using a 12 × 10 mm Cocoon duct occluder (Vascular Innovations Co., Thailand) using a standard technique. The pulmonary arterial pressure was documented to be less than 50% of the systemic pressure prior to device deployment. The final angiogram revealed a well-deployed device with a moderate (L-R) residual shunt [Figure 1]a. The shunt was expected to resolve with progressive thrombus formation and the child was discharged on diuretics. At 6-month follow-up, echocardiogram revealed a significant (L-R) shunt persisting through the duct occluder, with LALVVO and moderate MR. Although there was no hemolysis, the child was symptomatic with exertional dyspnea and poor weight gain. Deployment of a coil inside the Cocoon duct occluder followed by deployment of an Amplatzer duct occluder (ADO II) adjacent to the Cocoon device successfully reduced the large shunt to a trivial one. Hemodynamic data revealed half-systemic pulmonary artery pressure. 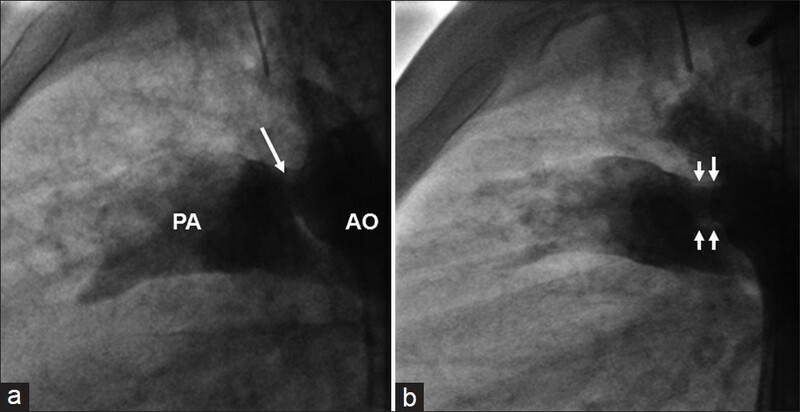 An aortogram done in lateral, right anterior oblique and anteroposterior view revealed good positioning of the previously implanted PDA device with no deformation or change in orientation. However, there was a large left to right shunt, with contrast flowing through the device as well as exiting superolaterally from around the body of the device. 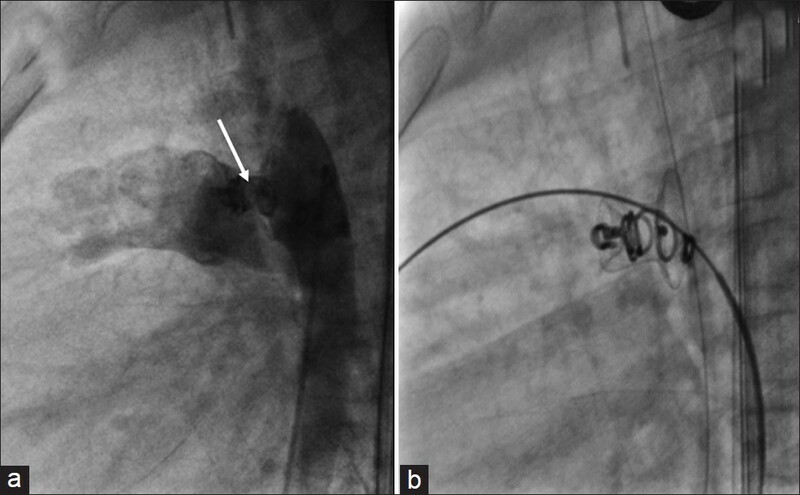 Endothelialization around the central part of the device was evident angiographically with at least 1 mm separation between the device and vascular lumen [Figure 1]b similar to the observation by Javois,  suggesting that the device was secure. The tip of a 5F Judkin's right coronary artery (RCA) catheter was forced from the retrograde route into the device. The RCA catheter was exchanged for an M-Vert 5F catheter (Merit Medical Systems, South Jordan, USA) through which a 38-8-6 free embolization coil (Cook, Bloomington, USA) was deployed inside the previously deployed device [Figure 2]a. As the shunt remained undiminished, it was decided to deliver two additional smaller Cook embolization coils (38-3-3) inside the device. Both these smaller coils, on delivery, migrated across the device into distal left pulmonary artery branches and being inaccessible were not retrieved. A lateral projection during delivery of both smaller coils confirmed that the catheter tip had not crossed the pulmonary end of the large PDA device. However, we presume that the delivery catheter tip may have been abutting the wall of the device with inadvertent delivery of the two small coils across the device into the space around the pulmonary end of the device. This was the evidence of the presence of a large space between the device and the wall of the PDA and the prime reason for persistence of the large residual shunt despite one large coil within the device [Figure 2]a. On observation over the next 48 hours, the shunt did not decrease and hence the child was catheterized again. The PDA occluder was again entered from the retrograde route with a 5Fr RCA catheter over a straight tip 035 Terumo wire. Persistent attempts to cross the device with the wire resulted in the wire exiting the body of the device into the ductal lumen superolaterally and from there into the main pulmonary artery (MPA) [Figure 2]b. The wire entry point at the aortic disc of the device was balloon dilated with a 2 mm coronary balloon catheter over a 0.014" BMW PTCA guide wire (Abbott, Santaclara, USA). A 5Fr right coronary guiding catheter was then manipulated over the wire into the MPA. A 6 × 4 mm ADO II (AGA Medical Corporation, North Plymouth, USA) was then deployed through the guiding catheter with the distal disc at the pulmonary end, the middle cylindrical portion adjacent to the body of the Cocoon occluder and the proximal disc in the descending aorta, flush with the aortic disc of the Cocoon occluder [Figure 3]a. Immediate post-procedure aortogram showed a significantly reduced shunt [Figure 3]b, which further decreased to show only a restrictive trivial shunt by echocardiography 24 hours later [Figure 3]c. Five months post-procedure, the child is reportedly asymptomatic with good weight gain and with no further episodes of respiratory tract infections. There was also no evidence of hemolysis after the second procedure. Significant residual flows are likely to occur with large ductus arteriosus, tubular (type C) ductus and with vascular plug devices lacking internal fabric. , In our patient, a 5Fr guiding catheter over a guide wire could be maneuvered through the aortic disk of the occluder into the ductal lumen and out into the pulmonary artery. This suggested that the device had probably not conformed to the ductal lumen completely and apposition with the ductal wall was incomplete. Although endothelialization appeared to be incomplete [Figure 1]b, an interval period of 6 months between catheterizations ensured stability of the device during catheter manipulation. In most instances, the aim of transcatheter occlusion of residual flow is to reduce the large left-to-right shunt to a low velocity flow, so as to prevent complications and facilitate thrombus formation and endothelialization. In our patient, a large shunt persisted even after 48 hours of placing a sizeable embolization coil within the Nitinol occluder, needing a second device to be placed adjacent to it. Though it lacks internal polyester fabric, ADO II was our choice for second device because of the presence of retention disk at both ends and easy delivery through a smaller delivery sheath. Our experience reveals that transcatheter intervention to occlude residual ductal flow is feasible and can be safely performed about 3-6 months after the initial procedure. It is important to look for shunt both through and around the device. The ADO II appears to be a useful device in such a challenging situation. 1. Masura J, Walsh KP, Thanopoulous B, Chan C, Bass J, Goussous Y, et al. Catheter closure of moderate to large sized patent ductus arteriosus using the new Amplatzer duct Occluder: Immediate and short-term results. J Am Coll Cardiol 1998;31:878-82. 2. Javois AJ, Husayni TS, Thoele D, van Bergen AH. Inadvertent stenting of patent ductus arteriosus with Amplatzer Vascular Plug. Catheter Cardiovasc Interv 2006;67:485-9. 3. Kreutzer J, Ryan CA, Gauvreau K, van Praagh R, Anderson JM, Jenkins KJ. Healing response to the clamshell device for closure of intracardiac defects in humans. Catheter Cardiovasc Interv 2001;54:101-11. 4. Hosking MC, Benson LN, Musewe N, Dyck JD, Freedom RM. Transcatheter occlusion of the persistently patent ductus arteriosus. Forty-month follow-up and prevalence of residual shunting. Circulation 1991;84:2313-7. 5. Pass RH, Hijazi ZM, Hsu DT, Lewis V, Hellenbrand WE. Multicenter USA Amplatzer patent ductus arteriosus occlusion device trial, initial and one-year results. J Am Coll Cardiol 2004;44:513-9. 6. Anil SR, Sivakumar K, Philip AK, Francis E, Kumar RK, Clinical course and management strategies for hemolysis after transcatheter closure of patent arterial ducts. Cathet Cardiovasc Interv 2003;59:538-43.